The human propensity to categorize is based on trying to make sense of the world. The act of categorization is based on how to group things together and how to relate those things and groups to one another. Categorization demands that we characterize or describe the things of the world using what we have termed attributes in order to find similarities . Categorization may also be based on the relationships of things to external things . No matter the method, the results of these categorizations tend to be hierarchical, reflective of what we see in the natural world. We see hierarchies in Nature based on bigger and more complex things being comprised of simpler things, based on fractals or cellular automata, or based on the evolutionary relationships of lifeforms. According to Annila and Kuismanen, “various evolutionary processes naturally emerge with hierarchical organization” . Hierarchy, and its intimate relationship with categorization and categories, is thus fundamental to the why and how we can represent knowledge for computable means. Depending on context, we can establish hierarchical relationships between types, classes or sets, with instances or individuals, with characteristics of those individuals, and between all of these concepts. There is potentially different terminology depending on context, and the terminology or syntax may also carry formal understanding of how we can process and compute these relationships. Nillson provides a general overview of these kinds of considerations with a useful set of references . As early as 1997 Doyle noted in the first comprehensive study of KR languages, “Hierarchy is an important concept. It allows economy of description, economy of storage and manipulation of descriptions, economy of recognition, efficient planning strategies, and modularity in design.” He also noted that “hierarchy forms the backbone in many existing representation languages” . The basic idea of a hierarchy is that some item (‘thing’) is subsidiary to another item. Categorization, expressed both through the categories themselves and the process of how one splits and grows categories, is a constant theme in knowledge representation. The idea of hierarchy is central to what is treated as a category or other such groupings and how those categories or groupings are tied together. A hierarchical relationship is shown diagrammatically in Figure 1 with A or B, the ‘things’, shown as nodes. Again, though we have now labeled the relationships, which in a graph representation are the edges between the nodes, it is still unclear the populations to which these relations may apply and what their exact semantic relationships may be. Note that, depending on context, some of the items may reside in either Secondness or Thirdness (depending on whether the referent is a particular instance or a general). Also note the familial relationships shown: child-parent-grandparent and child-child relationships occur in actual families and as a way of talking about inheritance or relatedness relations. The idea of type or is-a is another prominent one in ontologies and knowledge graphs. Natural classes or kinds, for example, fall into the type-token relationship. Also note that mereological relationships, such as part-whole, may also leave open ambiguities. We also see certain pairs, such a sub-super, child-parent, or part-whole, need context to resolve the universal category relation. 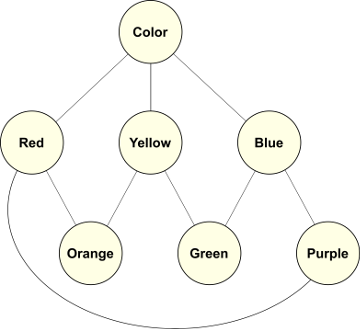 Reliance on item labels alone for the edges and nodes, even for something as seemingly straightforward as color or pairwise relationships, does not give us sufficient information to determine how to evaluate the relationship nor how to properly organize. We thus see in knowledge representation that we need to express our relationships explicitly. Labels are merely assigned names that, alone, do not specify the logic to be applied, what populations are affected, or even the exact nature of the relationship. 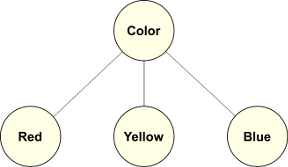 Without these basics, our knowledge graphs can not be computable. Yet well over 95% of the assignments in contemporary knowledge bases have this item-item character. We need interpretable relationships to describe the things that populate our domains of inquiry so as to categorize that world into bite-sized chunks. Salthe categorizes hierarchies into two types: compositional hierarchies and subsumption hierarchies . Mereological and part-whole hierarchies are compositional, as are entity-attribute. Subsumption hierarchies are ones of broader than, familial, or evolutionary. Cottam et al. believe hierarchies to be so basically important as to propose a model abstraction over all hierarchical types, including levels of abstraction . These discussions of structure and organization are helpful to understand the epistemological bases underlying various kinds of hierarchy. We should also not neglect recursive hierarchies, such as fractals or cellular automata, which are also simple, repeated structures commonly found in Nature. Fortunately, Peirce’s universal categories provide a powerful and consistent basis for us to characterize these variations. When paired with logic and KR languages and “cutting Nature at its joints” , we end up with an expressive grammar for capturing all kinds of internal and external relations to other things. So far we have learned that most relationships in contemporary knowledge bases are of a noun-noun or noun-adjective nature, which I have loosely lumped together as hierarchical relationships. These relationships span from attributes to instances (individuals) and classes  or types, with and between one another. We have further seen that labels either for the subjects (nodes) or for their relationships (edges) are an insufficient basis for computers (or us!) to reason over. We need to ground our relationships in specific semantics and logics in order for them to be unambiguous to reasoning machines. Typologies — are essentially multi-inheritance taxonomies, with the hierarchical organization of types as natural as possible. Natural types (classes or kinds) enable the greatest number of disjoint assertions to be made, leading to efficient processing and modular design. Typologies are a central design feature of KBpedia; see further . Typically KR formalisms and their internal ontologies (taxonomy or graph structures) have a starting node or root, often called ‘thing’, ‘entity’ or the like. Close inspection of the choice of root may offer important insights. ‘Entity’, for example, is not compatible with a Peircean interpretation, since all entities are within Secondness. KBpedia’s foundational structure is the subsumption hierarchy shown in the KBpedia Knowledge Ontology (KKO) — that is, KBpedia’s upper ontology — and its nodes derived from the universal categories. The terminal, or leaf, nodes in KKO each tie into typologies. All of the typologies are themselves composed of types, which are the hierarchical classification of natural kinds of instances as determined by shared attributes (though not necessarily the same values for those attributes). Most of the types in KBpedia are composed of entities, but attributes and relations also have aggregations of types. Of course, choice of a KR formalism and what structures it allows must serve many purposes. Knowledge extension and maintenance, record design, querying, reasoning, graph analysis, logic and consistency tests, planning, hypothesis generation, question and answering, and subset selections for external analysis are properly the purview of the KR formalism and its knowledge graph. Yet other tasks such as machine learning, natural language processing, data wrangling, statistical and probabalistic analysis, search indexes, and other data- and algorithm-intensive applications are often best supported by dedicated external applications. The structures to support these kinds of applications, or the ability to export them, must be built into the KR installation, with explicit consideration for the data forms and streams useful to possible third-party applications. The most common analogous terms to attributes are properties or characteristics; in the OWL language used by KBpedia, attributes are assigned to instances (called individuals) via property (relation) declarations. The act of categorization may thus involve intrinsic factors or external relationships, with the corresponding logics being either intensional or extensional. Jørgen Fischer Nilsson. 2006. “Ontological Constitutions for Classes and Properties”. In Conceptual Structures: Inspiration and Application (Lecture Notes in Computer Science), 35–53. The first and more standard 3-color scheme was first explicated by J W von Goethe (1749-1832). What is actually more commonly used in design is a 4-color scheme from Ewald Hering (1834-1918). In the OWL 2 language used by KBpedia, a class is any arbitrary collection of objects. A class may contain any number of instances (called individuals) or a class may be a subclass of another. Instances and subclasses may belong to none, one or more classes. Both extension and intension may be used to assign instances to classes. RDF graphs are more akin to the first sense; OWL 2 graphs more to the latter. In the semantic Web space, “ontology” was the original term because of the interest to capture the nature or being (Greek ὄντως, or ontós) of the knowledge domain at hand. Because the word ‘ontology’ is a bit intimidating, a better variant has proven to be the knowledge graph (because all semantic ontologies take the structural form of a graph). Structure needs to be a tangible part of thinking about a new knowledge representation (KR) installation, since many analytic choices need to be supported by the knowledge artifact. Different kinds of structure are best for different tools or kinds of analysis. The types of relations chosen for the artifact affects its structural aspects. These structures can be as simple and small as a few members in a list, to the entire knowledge graph fully linked to its internal and external knowledge sources.